Looks like that "dare" to tell fact from fiction in the Houdini miniseries is being taken up by more than just us Houdini bloggers. Check out this this report from NBC affiliate KSDK Channel 5 in St. Louis. This is pretty awesome. 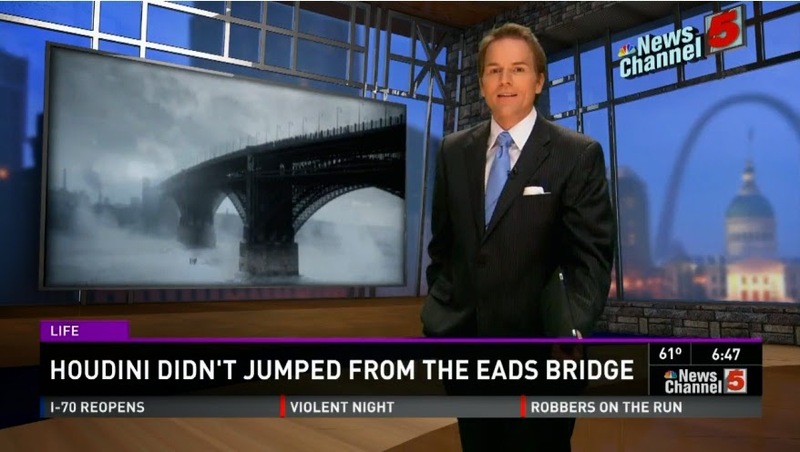 To be fair to the embattled HISTORY/Lionsgate (and I still think the real offenders here are producer Gearld W. Abrams and screenwriter Nicholas Meyer), they obviously chose the Eads Bridge for maximum visual impact. But a jump from a bridge this high would obviously be suicide. This just speaks to the fact that cites are proud of their associations to Houdini and his stunts. In Boston there is and plaque commemorating Houdini's jump from the Harvard Bridge. People care about Houdini history because it's also their own history, and messing with that is messing with civic pride. This news story is a nice example of that, and I certainly hope the makers of the Houdini miniseries see this. 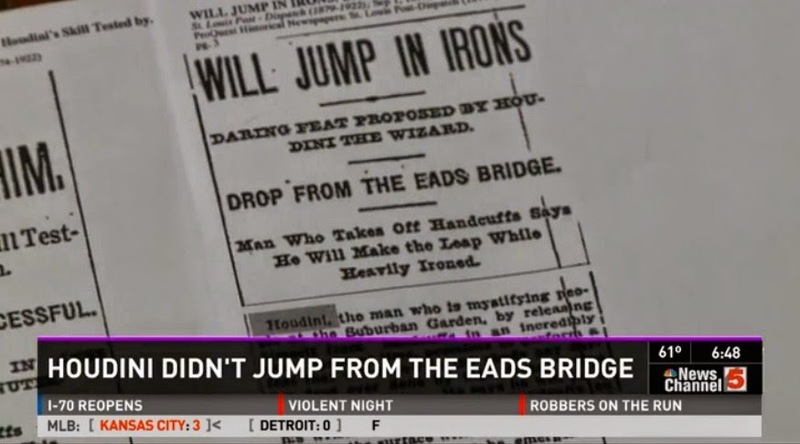 One thing that's surprising here is that the Missouri History Museum discovered a Houdini Eads Bridge jump announcement in 1899. That's extremely early for Houdini to be talking about a bridge jump of any kind. I wonder if this might actually be the first mention of a bridge jump, even thought it ultimately didn't happen. I had to take the embedded video off this post because it would auto start and I don't know how to prevent that. Means every time you visited this site it would play. But I put a link to the site itself. Make the effort to watch. This is really great. I'm glad someone is outraged by the historical inaccuracies. Maybe this will get some people who blindly believe everything shown in the miniseries to start to question. Out of curiosity, how high were most of the bridges Houdini jumped from? I know Harvard Bridge was less than fifteen feet down, but I'd be interested to know how high others were, like the Belle Island Bridge. I wonder which was the highest bridge he jumped from. Odd that's a fact that we don't automatically know. The original belle island bridge was not be tall. Don't know how many feet but I read someone who posted that his Grandmother could have jumped from it. Original belle island bridge would have been a 25 foot jump. BTW, did you notice on that first banner it says "Houdini didn't JUMPED…"? Gotta love local news.